Joining a sports league isn’t something you grow out of just because you’ve graduated, got a job, or maybe even a partner and children of your own. Playing in a sports leagues has all kinds of benefits, from your social life to your health, but that doesn’t mean you have to get yourself hockey-rink-fit in order to compete. In cities across Canada, but especially Toronto, alternative sports like axe throwing are becoming more and more popular as people connect with them more than traditional sports. Axe throwing has a widespread appeal, but it also has a younger, edgier demographic drawn to it (just take one look at the amazing tattoos on some die-hard players). But why should you join an axe throwing league in the first place? Axe throwing may be an individual sport, but it doesn’t mean you won’t find a welcoming community on the pitch. It’s as much spectator sport as it is one to participate in; you’ll share in the nail-biting match ups, the upsets and the tie-breakers, and before long you too will be getting cheered on by those you’ve faced in the past. Axe throwing brings in people from all walks of life, from bartenders and bouncers to bankers and baristas. Axe throwing helps people unwind after the stresses of their everyday life and connect with something more primal. 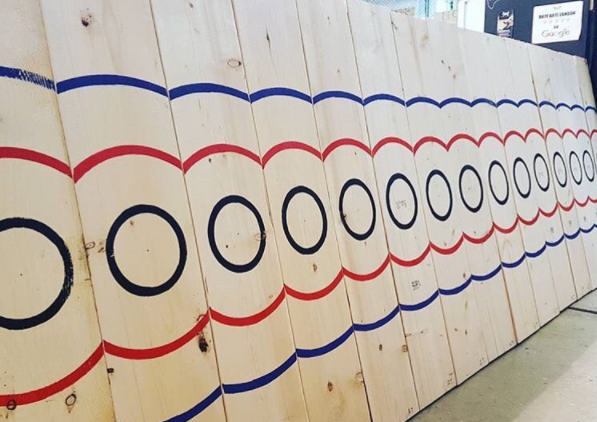 You’re bound to make new friends at a league, especially in the laid-back atmosphere of a Toronto league like BATL (also known as the Backyard Axe Throwing League). As a game of precision and accuracy more than strength and endurance, this sport will train your sense of discipline and accuracy. It’s the kind of mindset you can take back to work that will help you excel in business. Stress is one of the leading factors for health conditions like heart disease, obesity, depression, diabetes, Alzheimer’s, and more. Getting together with new friends at BATL and hearing the satisfying crunch of steel biting into the wood of the bullseye will get your adrenaline pumping and help vent some of the frustrations you’ve built up at work and at home. It means you can get back to your life with balance, poise, and improved mental and physical health. Axe throwing may not seem like it’s the kind of sport that’s going to turn you into a fitness guru, but it will improve your health all around. If you’re ready to add all of this and more to your life, sign up for an axe throwing league in Toronto. There’s no better way to relax and unwind after a stressful day of work, meet new people, and challenge yourself in new and exciting ways. Don’t worry if hockey or baseball isn’t your thing, there are all kinds of people in the world and some of the more interesting ones can be found at the axe throwing pitch.